Northampton Dental is a full-service family dental practice located at 24036 Kuykendahl Road Suite 300 in Tomball, TX 77375. Based on the superior ratings and exceptional reviews from their actual patients, Dr. Nori Kamaya has been awarded as a 2017 Top Patient Rated Dentist from Find Local Doctors online directory. Our goal is to be a top dental practice that partners with each patient to achieve their best smile and optimal oral health. Therefore, we are very proud to accept the Top Patient Rated Dentist award this year, says Dr. Kamaya of Northampton Dental. Northampton Dental serves patients of all ages coming from the Tomball, Spring, the Woodlands and North Houston areas. The family practice is set apart by their ability to provide comprehensive dentistry with a modern and comfortable approach. Northampton Dental is led by an experienced and talented dentist, Dr. Nori Kamaya. He brings training in all facets of dentistry, including general, restorative and cosmetic services. 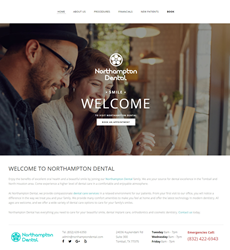 Patients of Northampton Dental can receive routine cleanings, gum disease therapy and other basic treatments as well as take advantage of specialized services such as dental implant treatment, porcelain veneers and Invisalign. Regardless of whether patients are entrusting Northampton Dental to protect their oral health, restore damaged teeth or improve their smile appearance, they continue to leave superior reviews for the Tomball dental practice. It is the numerous and consistent online ratings and reviews left by their actual patients that led Find Local Doctors to recognize Northampton Dental as a 2017 Top Patient Rated Dentist. Find Local Doctors is an established online directory that helps consumers find the most credible and reputable healthcare providers in their area. The reviews garnered by Northampton Dental are centered on the favorable experience that patients have received. Northampton Dental makes it a priority to deliver top quality dental care through comfortable and convenient services. Patients are offered extended hours, same day dentistry, financing plans and soothing amenities to create a more enjoyable and hassle-free experience in dental care. Furthermore, Northampton Dental is equipped to provide care for the entire family in one place, from toddlers to senior adults. “We are ecstatic to receive an award that is based on actual patient feedback. Our goal is to be a top dental practice that partners with each patient to achieve their best smile and optimal oral health. Therefore, we are very proud to accept the Top Patient Rated Dentist award this year,” says Dr. Kamaya of Northampton Dental. Dr. Kamaya graduated from University of Michigan School of Dentistry and completed a rigorous post graduate general practice residency treating complex dental cases at the VA Hospital in Salt Lake City, Utah. Dr. Kamaya has become proficient in treating patients of all ages and walks of life. He has developed a reputation for compassionate, transparent and personalized dental care in the Tomball, Spring, the Woodlands and North Houston community. For more information about Northampton Dental, please visit http://www.northamptondental.com or call the office directly at (832) 639-6350.